lil fish studios: customers' creations - love the sheep! Ack! Is that cute or what? Love? Why, yes I do. 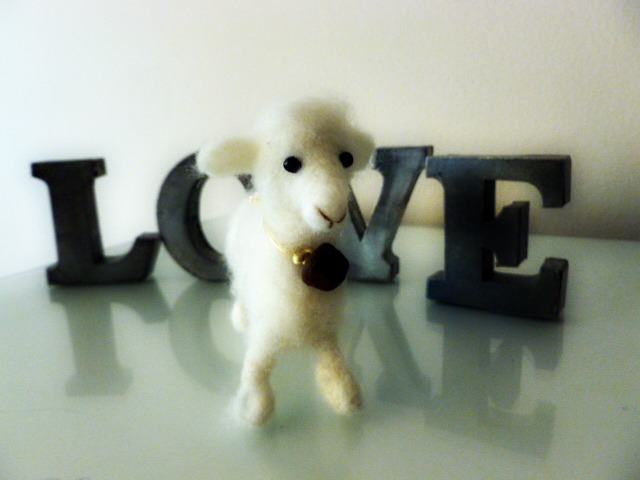 This is the sheep that sox and patches (who has a cute etsy shop herself) made from my kit. Didn't she do a fabulous job? You can buy the kit in my shop, if you'd like to make some yourself. If you do, please share photos, I love to see the finished sheepies. Jennifer did a great job with your kit, Lisa. The sheep is adorable. Can I also mention that we are the proud owners of two of Jennifer's monsters? You are two very talented women. That is just adorable. I'll have to take a look at that kit!